Tomorrow marks the 47th anniversary of the premiere of the great 1971 movie Willy Wonka and the Chocolate Factory, wherein the reclusive owner of the Wonka Chocolate Factory decides to place golden tickets in five of his famous chocolate bars, and allow the winners of each to visit his factory with a guest. Since restarting production after three years of silence, no one has come in or gone out of the factory. Needless to say, there is enormous interest in finding a golden ticket! In the movie, you can't help but feel that Charlie's odds must have been much, much higher than the nasty Veruca Salt's (or any of the other winners). But is there statistical evidence of that? For the Chi-Square portion of the output, Minitab not only refuses to provide a p-value but gives two warnings and a note. The Fisher's exact test can be performed, however, and tests whether the likelihood of a winning tickets was the same for both Charlie and Veruca. The p-value of 0.0000079 confirms what we all knew—karma was working for Charlie and against Veruca! For fun, let's ignore this evidence that the odds were not equal for each child. Let's pretend that the odds are the same, and a really unlikely thing happened anyway because that's what makes the movie great. Aside from our two data points, we have reports from two children in the classroom that they have opened 100 and 150 bars, respectively, and neither won. 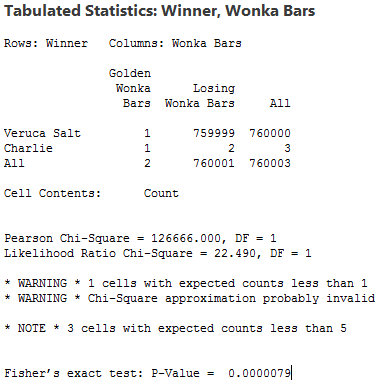 So we have two golden tickets among 3 + 760,000 + 100 + 150 = 760,253 Wonka bars. This would be a proportion of 3/760,253 = 0.00000395 or 0.0000395%. Think those odds are low? That represents an inflated estimate! That is because rather than randomly sampling many children, our sample includes two known winners. Selecting four children at random would almost certainly produce four non-winners and the estimate would be 0%. There is one additional data point that doesn't really make logical sense, but let's use it to come up with a low-end estimate by accepting that it is likely not a real number. At one point, a news reporter indicates that five tickets are hidden among the "countless billions of Wonka bars." Were there actually "countless billions" of unopened Wonka bars in the world? Consider that the most popular chocolate bar in the world—the famous Hershey bar—has annual sales of about 250 million units. And that's per year! It is very, very unlikely that there were countless billions of unopened Wonka bars from that single factory at any one time. 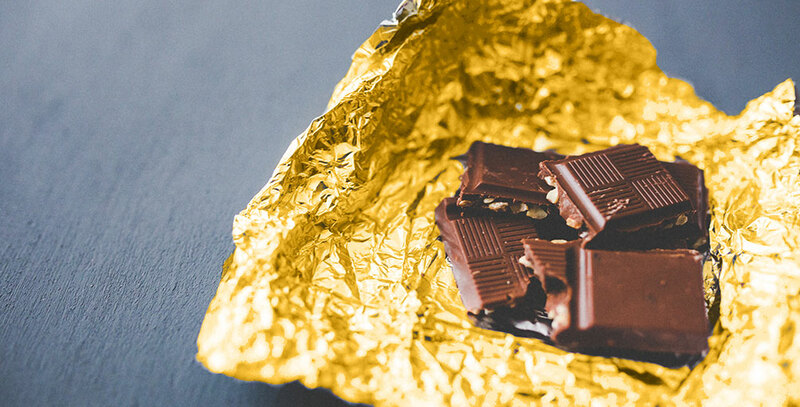 Further, that news report is about the contest being announced, so the Wonka factory had not yet delivered the bars with the golden tickets inside. Suffice to say, this is not an accurate number. But let's suppose that even 1 billion Wonka bars were produced in the run that contained the golden tickets. Then the odds of a single bar containing one would be 5/1,000,000,000 = 0.000000005 or 0.0000005%. CHARLIE: "I've got the same chance as anybody else, haven't I?" GRANDPA JOE: "You've got more, Charlie, because you want it more! Go on, open it!"